Not sure what you want to say, but love writing stories? Let Subtext pick a random structure for you. Open up your Story, and then select Add and Random. 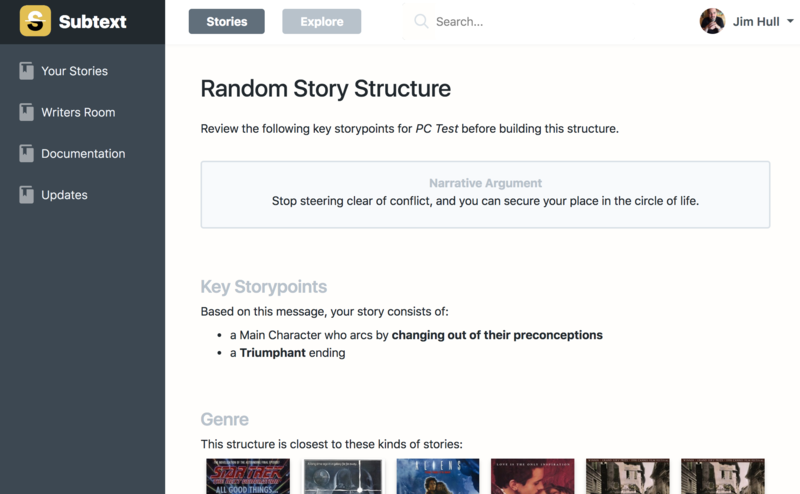 Subtext will search its extensive database of unique story structures, and pick one completely from random. Once chosen, you'll be presented with a screen where you can confirm that you want to attach this narrative to your story. Review the Narrative Argument and the Key Storypoints of Subtext's selected story structure. Remember, the Narrative Argument is the essence of your story's structure. Plot events and character development are determined by this thematic message. Make sure it's something you want to write about, as everything that follows is based on it. In addition, you'll find a handful of similar stories listed that approximate the same kind of structure based on Genre and key storypoints. If this sounds like the kind of story you want to write--and you feel inspired to start writing--simply attach this narrative to your story by selecting Add Structure at the bottom of the page. If you decide you want to try something else, tap Find Another and Subtext will oblige by looking for another narrative.